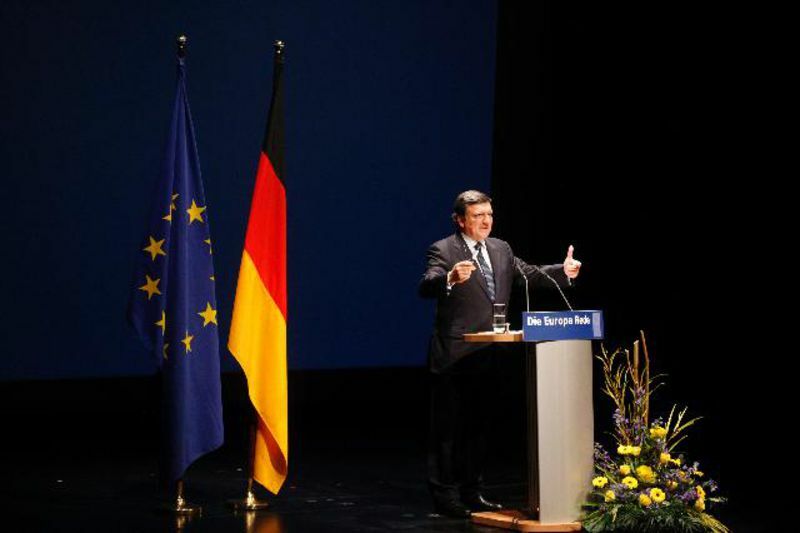 At the height of the debt crisis and on the occasion of the anniversary of the fall of the Berlin Wall, a symbol of the German and European unification, European Commission President Jose Manuel Barroso delivered a key speech precisely in Berlin. Amid growing fears of division of the EU into two gears - the euro area and the rest - and fears that the euro area could break up or, at least, the weakest countries to drop out, the Commission President clearly stated that he opposed the division of the EU and the eurozone, that euro governance should be done within the framework of the existing institutions and that ceding more powers to the European institutions did not mean less democracy. "So let us be clear: the Treaties don't define the euro area as something that is distinct from the European Union. 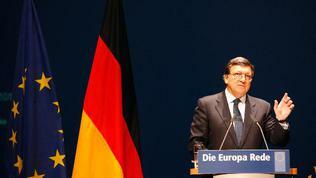 The Treaties define the euro area as the core of the European Union." "And we will defend the integrity of the single market and the integrity of the single currency. 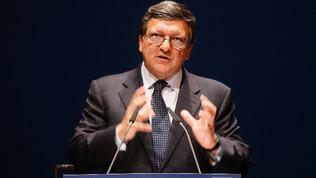 The EU as a whole and the euro area belong together and should not be divided," Mr Barroso said. Thus he supported the position of countries like the UK which fear that the formal separation of the euro area from the other ten countries would have disastrous consequences for the single market. If the EU or the eurozone broke apart it would cost the Europeans half of their gross domestic product. 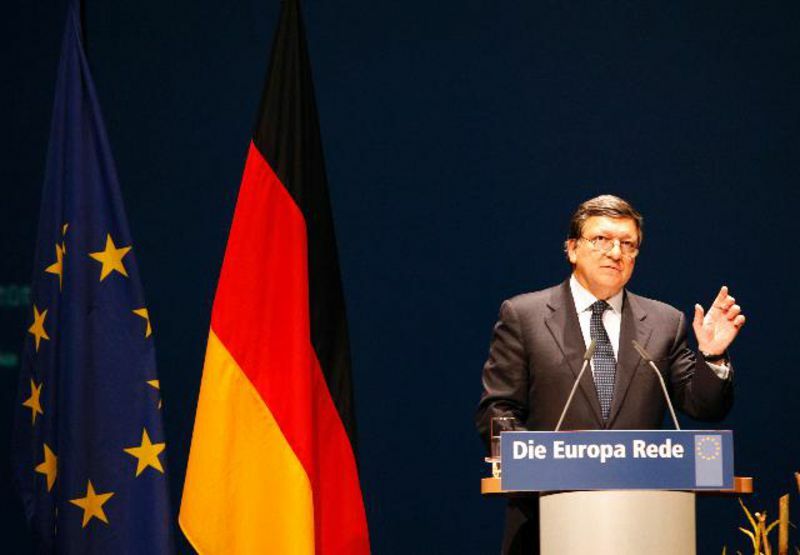 Even if the eurozone survived but shrank to a small number of core countries, Germany's GDP would decline by 3% and the country would lose one million jobs, Mr Barroso warned. "Let me be clear - a split union will not work," because you could not have an integrated core and a disengaged periphery, the Commission President noted. "It would be absurd if the very core of our project – and economic and monetary union as embodied in the euro area is the core of our project – so I say it would be absurd that this core were treated as a kind of "opt out" from the European Union as a whole. No, the euro area is not an "opt out" from the European Union. In fact all the European Union should have the euro as its currency. So the challenge is how to further deepen euro area integration without creating divisions with those that are not yet in it." 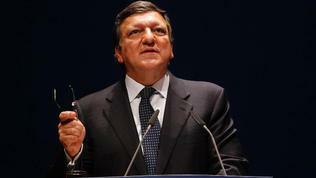 Jose Manuel Barroso noted that only two Member States (Denmark and the UK) had negotiated an "opt out" from the monetary union but for all others "the Treaties foresee accession to the euro area both as an obligation and as a right." Of course, if the criteria are met. And the verification whether they are met should be "stricter than in the past," Mr Barroso hinted, regarding the criticisms that some countries that face problems now, were not entirely ready for the euro, especially Greece. "But to create the idea now that we have two unions in Europe means disunion, means, in fact, a separation of the members of the euro area from those who are not yet members of the euro area. Let's take a country like Poland. They have already stated very clearly that they want to join the euro as soon as all the criteria are met. So why should we now put more conditions for the countries that want to be in the core of the European project feel that they are left some time behind. I don't think it is fair for those countries." "Let me be clear - that is not about power grabbing," Barroso announced before setting out his vision of who should lead the EU and the euro area in particular. He recalled that the policy of balance of power prevailed in Europe in the 19th century, causing several exhausting wars. "That is why, after the Second World War we created common, supranational institutions and methods." 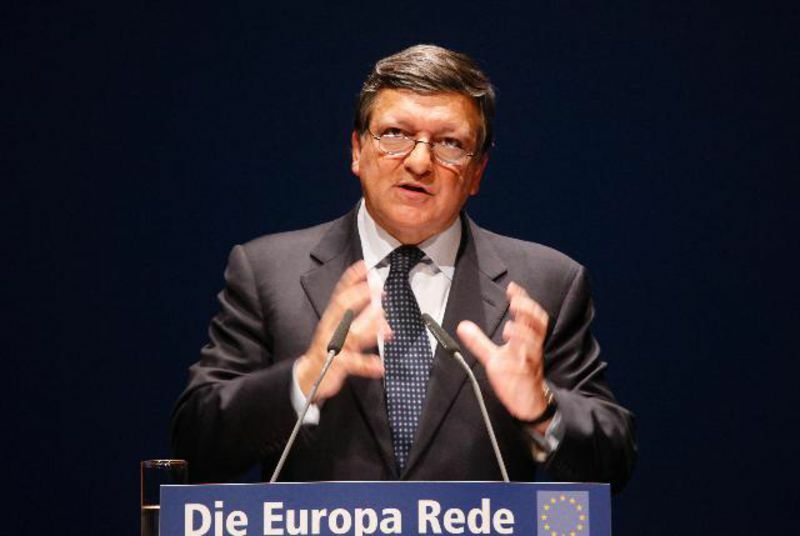 Today's problems are the result precisely of the lack of respect for the Community method because an economic and monetary union is incompatible with the logic of pure intergovernmentalism, Barroso said. Because compliance with the rules could not be ensured by the "unstable logic of political influence or manoeuvring, of diplomatic negotiation or of backroom bargaining." "And this means that the deepening of the euro area integration, including by Treaty change must preserve the EU's political, legal and institutional coherence. This means that the deepening of the euro area integration must be done through the Community method, preserving and developing the role of the Community institutions." Barroso gave an example with the appointment of Commissioner Olli Rehn for vice president of the Commission in charge of Economic and Monetary Affairs and the euro. He said bluntly that the EU had enough institutions to manage the euro area, including "the European Parliament that is directly elected," so it was not necessary to create new ones. This will make things “more opaque, more time consuming, less coherent and less readable for the common citizens”, he said. One of the thorniest points in the current debate on "more or less Europe" involves precisely the democratic process - whether the transfer of more powers to European institutions by democratically elected national authorities is a blow to democracy. 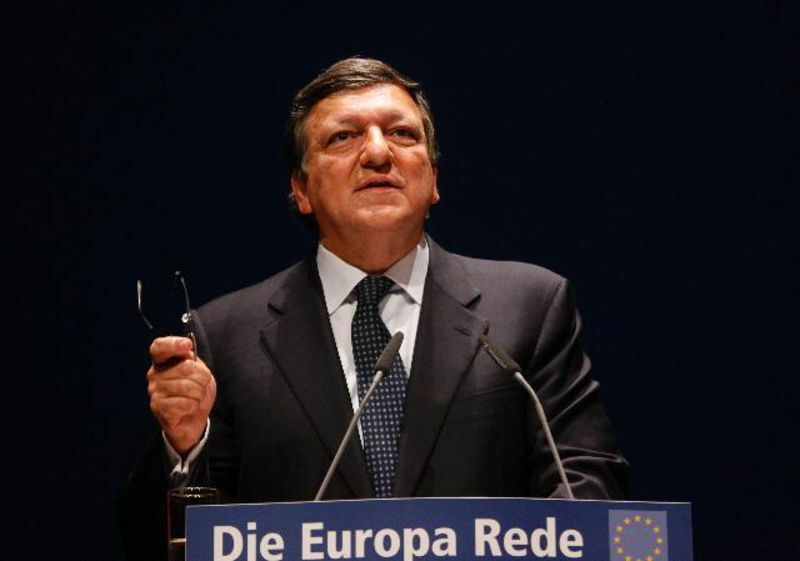 According to Jose Manuel Barroso "both the national democracy and the European democracy have to respect each other": "we cannot – as it is sometimes done – oppose the national democratic processes to the European democratic process. We cannot substitute national democracies with the European democratic process. Nor can we replace the European democratic process with the national ones. We need both for the Union to work in a way that is seen as a legitimate way by our citizens." The alternative, according to the Commission President, is to "hand over material sovereignty, the real sovereignty, to markets; it will no longer be the sovereignty of our Member States, it will be the sovereignty of the markets, the sovereignty of financial speculators, the sovereignty of global operators not subject to any kind of democratic scrutiny." In line with the principles outlined by Mr Barroso, the Commission will present several proposals in the coming days, in addition to the package of 6 legislative proposals to strengthen the EU economic governance, approved by the Parliament in September and by the Council a few days ago. According to Mr Barroso, the eurozone governance should be placed within the overall Treaty framework to "ensure the legal and institutional coherence and the compatibility between the euro area and the EU as a whole." The Commission will therefore propose that Parliament and Council approve the regulation on deeper fiscal surveillance in the euro area, based on Article 136 of the Treaty on the Functioning of the EU (TFEU). It will entitle the Commission and the Council as regards the euro area countries posed in an excessive deficit procedure to examine national draft budgets ex-ante and to adopt an opinion on them before adoption by the national parliaments, requesting a second reading in serious cases. In addition, the Commission will monitor budget execution and, if necessary, suggest amendments in the course of the year. The Commission President has announced such an intention a month ago, while presenting his "Roadmap to Stability and Growth." The Commission will also propose a regulation, linking the assistance provided by the eurozone rescue fund EFSF and its successor the European Stability Mechanism with country surveillance, on the basis of article 136 of the Treaty. On the one hand, such a regulation will provide a link between financial assistance under the EFSF and the future permanent rescue fund ESM, and on the other will bind this assistance with enhanced Treaty-based surveillance. 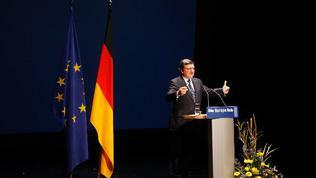 The third proposal would be about a common representation of the eurozone in the International Monetary Fund. "Does anyone know that the euro area Member States taken together are the biggest contributor to the IMF?," Mr Barroso asked rhetorically. It is not clear who will be the face of this common representation - whether Commissioner Olli Rehn or European Council President Herman Van Rompuy, who heads the summits of the eurozone and is called by the media, "Mr Euro". As promised, the Commission will present a green paper on the introduction of ‘euro stability bonds’. "I know this is controversial," Barroso said, but "once the euro area is fully equipped with the instruments necessary to ensure both integration and discipline, the issuance of joint debt will be seen as a natural and advantageous step for all. On condition that such Eurobonds will be "Stability Bonds": bonds that are designed in a way that rewards those who play by the rules, and deters those who don't." The green paper will present the options for joint issuance of bonds in the euro area. Some of them are possible under the current Treaties, but the introduction of "fully fledged 'Eurobonds'" will require Treaty changes, Commission President noted. The problem is that the Commission would be considered a democratic gevernment nowhere. Just having a European Parlement doesn't make a European democracy. Most dictators have elected parlaments in their countries. What surprises me is the reluctancy of many european politicians to a commission elected by voters, whether it will be directly or through the europarlamentaries? why are they so afraid of elections?